An old-fashioned jelly roll! A thin, yellow cake layer filled with raspberry jam, rolled and dusted with powdered sugar. I’m a notoriously impatient baker. Baking is just not my forte. It requires precision, accurate measurements, and proper mixing techniques. These attributes don’t come easily to me. I’d much rather add a pinch of this and a dab of that than to get out measuring cups and spoons. However, there are a few baked goods that I can manage fairly well. Drop cookies…yes. Muffins…okay. Cupcakes…definitely! 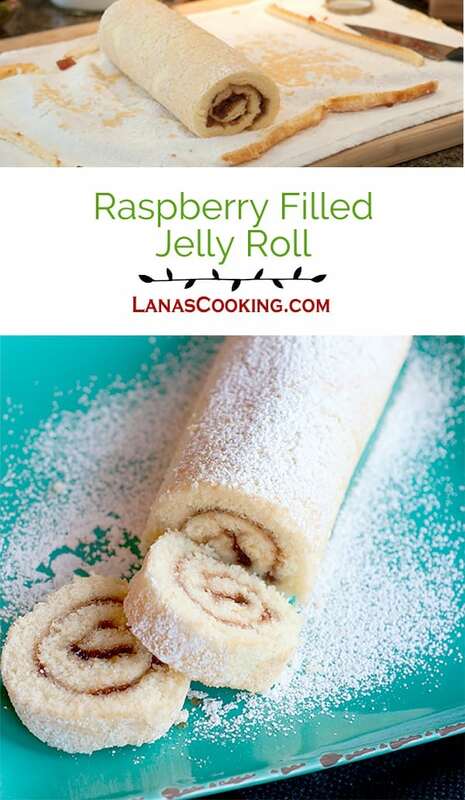 And best of all, this old-fashioned Raspberry Filled Jelly Roll. If you think you’ve never had a jelly roll, you might just know it by one of its many other names. They’re also called cake rolls, jam rolls, Swiss rolls, sponge rolls, and roulade. Even the famous Buche de Noel, or Yule Log, is simply a rolled cake. A southern jelly roll is a thin sponge cake filled with jam, jelly, or preserves which is then rolled and sprinkled with powdered sugar. It’s quick and easy to make, looks impressive on the plate, and kids and adults alike love it! I’ve used a low-sugar raspberry jam for this one, but strawberry is great as well. I would even use blueberry, blackberry, apricot, pineapple, or peach preserves. Whatever you like! Generously butter a 15×10 jelly roll pan. Cut a piece of parchment or waxed paper to fit the inside of the pan. Place the paper in the pan and butter it as well. Beat the eggs until very thick and pale yellow colored. This will take about 5 minutes. Gradually beat in the sugar. With the mixer on low speed, slowly add the water and vanilla. Still on low speed, gradually add the flour, baking powder, and salt, beating just until blended. Pour the batter into the prepared pan. Be sure to spread the batter into the corners. While the cake is baking, prepare a tea towel with a generous dusting of powdered sugar. Bake for 12-15 minutes or until a toothpick inserted in the center comes out clean. Remove the cake from the oven, loosen it from the edges of the pan, and immediately invert the hot cake onto the prepared tea towel. Carefully peel away the paper. While still hot, carefully roll the cake and towel starting from the narrow end. Cool the rolled cake on a wire rack for at least 30 minutes. Unroll the cake and remove the towel. Trim away any stiff edges if necessary. Spread the jam or jelly over the inside surface of the cake. Re-roll the cake. Wrap the cake loosely in waxed or parchment paper and refrigerate. When ready to serve, sprinkle generously with powdered sugar. Generously butter a 15x10 jelly roll pan. Cut a piece of parchment or waxed paper to fit the inside of the pan. Place the paper in the pan and butter it as well. Bake for 12-15 minutes or until a toothpick inserted in the center comes out clean. Remove the cake from the oven, loosen it from the edges of the pan, and immediately invert the hot cake onto the prepared tea towel. Carefully peel away the paper. While still hot, carefully roll the cake and towel starting from the narrow end. Cool the rolled cake on a wire rack for at least 30 minutes. Unroll the cake and remove the towel. Trim away any stiff edges if necessary. Spread the jam or jelly over the inside surface of the cake. Re-roll the cake. Wrap the cake loosely in waxed or parchment paper and refrigerate. When ready to serve, sprinkle generously with powdered sugar. My grandmother made these all the time; she had a row of grapes in the back yard and made jelly from them, so grape jellyrolls were the usual kind, but she also would make apricot or peach, also from jelly made from the trees in the back yard. After bragging on Grandma’s jellrolls, my ex decided she’d make one, too. It was pretty good, but had a strange aftertaste…which we later figured out was from the fabric softener she had used for the tea towel when doing a load of laundry. So pretty! My girls are fascinated with rolled sweets! That looks great! I always admire your ability to roll those things without it falling apart. Me…. well, let’s just say that it’s not a pretty sight. I always have trouble making the roll look perfect without cracks. I’m going to try your towel trick next time! Doing it freehand doesn’t work that great. It’s been too long since I’ve made a jelly roll. Thanks for the reminder how easy and delicious they are. This recipe was splendid! I was very impressed with how it turned out. Moist, sticky, stunning! I am making this again today using strawberry rhubarb jelly. Thank you for this amazing recipe! Just wanted to say that your step-by-step instructions are great and your website is too! I always wanted to try this but was intimidated but, this time will actually do this for my family for Valentines. Thanks for your explicit instructions. Lana, your jelly roll is a beauty! And I love all things raspberry!